It’s a new year and I want to start it off right. This year is all about commitment and the only way I see making those goals a reality is to keep them in my sights. I want more follow through and accountability for my goals. Here’s my first step toward that. 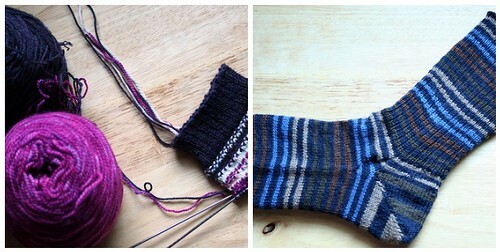 Finish a pair of socks – I have 2 pairs actively in progress so this should be doable. 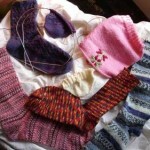 Finish the hoodie for my niece – I’ll admit that this goal is the biggest stretch. I’m making matching Necco Wafer Hoodies for my niece and nephew. They live in Dallas so I really need to get both of them done by end of February at the latest. I’m about halfway done with my niece’s hoodie. Connect with the community – I wrote about this on my professional blog but this is a goal for both parts of my life. I’m commenting a bit more on blogs (especially those who comment here) and I’ve become more active on the Sock Knitters Anonymous and the Stash and Burn Sock Yarn Knitdown forums. I also joined the Philly Burbs Meetup Group. My goal is to attend one meetup per month. Working out – go to the gym 3 times a week and do the treadmill at least twice a week. Cook healthy meals for leftovers – I want to make at least 4 meals this month that create leftovers. Good food and easy lunches plus saving a few bucks – can’t beat that. Continue weight loss – I want to be careful about setting a number goal for each week or month because I believe my success can be attributed to *not* having short term number goals. Approximately 1.5 pounds per month will keep me on track. But, if I don’t hit that number – or even if I gain a bit – I’ll use the following month to course correct. This may sound contrary to my opening sentence about follow through and commitment but it’s really not. It’s about committing to a healthy, life-long approach to weight loss and weight management. Post about these goals and next month’s goals by the first week of February. That’s it for January. I’ve listed several goals that tie back to my 2011 goals I posted last week. If I meet all these goals I will have started off 2011 strong, proud – committed. One of my goals is to see you more. This week is a little hectic. Are you guys free for dinner next Sunday (the 16th) or early next week? We’re on vacation the following week so we’re down to the wire on scheduling a monthly dinner. 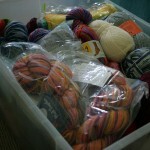 Also, you have yarn for 76 pairs of socks!? Holy smokes! Goals for the coming year… Somehow I’d completely forgotten about that. Might have to sit down and have a think what I want to achieve this year. Like the blue stripey socks! gosh, good luck! and welcome to the stashpact!